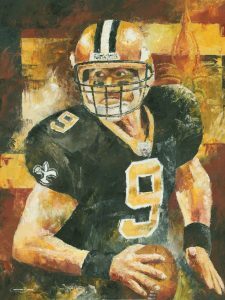 Do you, as a Saints football fan, would like Drew Brees prints hanging in your home or office? This is a famous oil painting of Drew Brees, the New Orleans Saints quarterback, making ready to pass the ball. The original artwork is 18″ x 24″ in size and we have giclees or prints on canvas available for sale! If you would like to order a custom Saints artwork have a look at all the other commissioned paintings created by the artist.